Yesterday The Mill London kicked off their brand new pop-up shop ‘Tee Shirt Thursdays’, an opportunity to support local up-and-coming businesses and to provide clients and The Mill team with the opportunity to purchase Tees from some of the latest and coolest brands of the moment. 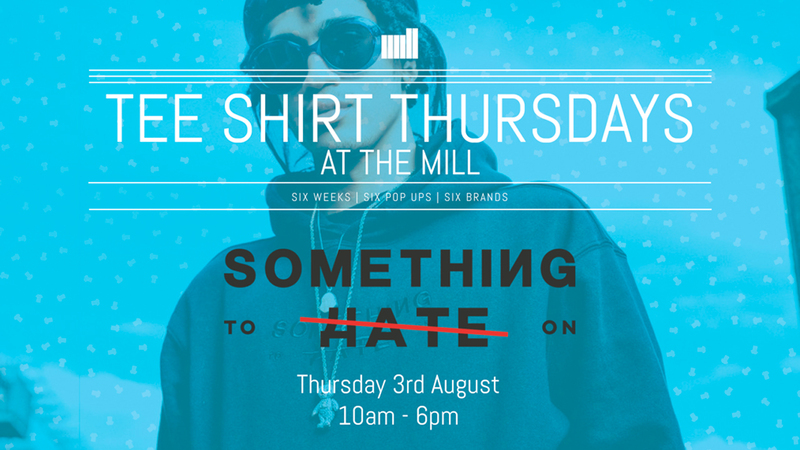 The six week long pop up sees a variety of labels takeover The Mill’s Loft space each Thursday to sell their original designs whilst showcasing their individual creative twist on the classic Tee Shirt. The launch of the series welcomed Homage Tees to the Windmill Street studio. Homage specialise in printing Tees with iconic faces on them, including the likes of David Attenborough, Louis Theroux and Prince. The creator of Homage Tees, who remains anonymous, plays on the concept of brand identity by mixing up iconic brand logos with well known celebrity names. This bold and controversial approach has attracted many celebrities including Skepta, Stormzy and Lily Allen who have all been seen sporting the brand. Next week the pop up will feature Tees from Something to Hate On, a brand new clothing range which is due to launch on the 1st of August. The Mill will have the privilege of getting the chance to see these fresh new designs within the first couple of days of the brand's launch. The Mill looks forward to welcoming one and all to their Loft space across the next six weeks.